Need your carpets cleaned? Things to consider..
How good is it to have lovely freshly cleaned carpet? Here at Terry’s Steam Cleaning we don’t mind telling you that there’s nothing we love more! Whether we’re playing with our kids or pets, just walking barefoot or even having the occasional lie-down, we spend a lot of time on our carpets; we also know that having a properly cleaned carpet is a must. When it comes to professional carpet cleaning services we know you’re looking for a thoroughly hygienically clean carpet combined with great service and at a very reasonable price. What else could you possibly want? How about what chemicals are used to clean your carpets? Many carpet cleaners use chemicals that may or may not be all that effective, and leave behind fumes and residue that may be detrimental to the health of your family and harmful to the environment. Our approach is to put your health and well-being as our number one priority. Carpet cleaning chemicals: What about the health of your kids and your pets? Fortunately, there are safe alternatives. We use the tried and tested steam clean using “hot water extraction” that penetrates your carpet removing the oily dirt, bacteria and chemicals. Others may try to persuade you that their reliance on harsh chemical cleaning agents is harmless but here at Terry’s Steam cleaning, we’re naturally sceptical of chemicals that we can’t pronounce. In short we’re happy to stick to what we know is both a super effective and safe solution. We know you want peace of mind that you and your loved ones are safe and of course that includes your pets. If you’re looking for a safe carpet cleaner who avoids potentially nasty chemicals then we’re here to help. We’ve been doing this for a long time – over 15 years - and our natural steam cleaning method not only provides a deep professional clean but it’s also eco-friendly and will help to maintain a healthy indoor environment. We recommend a professional clean at least every 12 months for a family of 2 and every 6 months for a larger family of 3 or more. 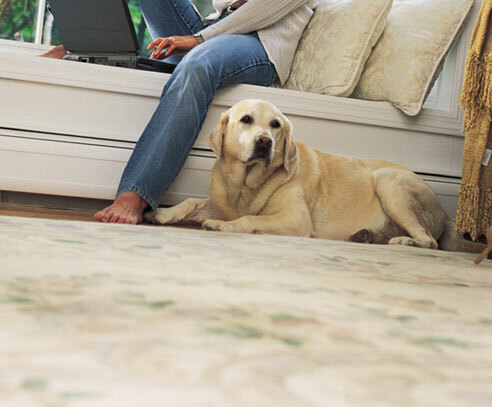 Even if your carpet still looks reasonably good it’s the allergens and bacteria that are of most concern. To protect your health and extend the life of your carpet a professional clean done regularly every 6 to 12 months is definitely the way to go. If you’re tempted to do it yourself then we want you to be aware that many carpet manufacturers warn against this as there is a high risk of over wetting your carpet which may cause mould and an unpleasant musty smell. You can easily damage your carpet and in the long run this could easily end up being not only an inferior finish, but also a much more expensive option. On those humid days or if ventilation is poor then we’ll leave carpet dryers and/or dehumidifiers to be sure of a professional finish, and at no additional cost. So you’ve decided it’s time for a professional clean. “I know” you may think to yourself “I’ll just call around for the cheapest price in town.” After all how hard can it be right? Well here at Terry’s cleaning we’re not so sure that’s a good idea. The industry is unregulated and as a result, there are many operators who simply purchase some old second-hand gear and then with no training, no experience and without a good reputation to maintain they have no choice but to try to buy their way into the market with nothing more than a low price. They’ll then have to rush around to get the job done as quickly as possible so they can make a buck. Why not give us a call today on (07) 3878 6000 to quote on your carpet cleaning or many other professional cleaning needs?